Maungdaw -- Three ethnic Rohingya farmers were killed and one was wounded in a landmine explosion in Western Myanmar this morning, an eyewitness said. 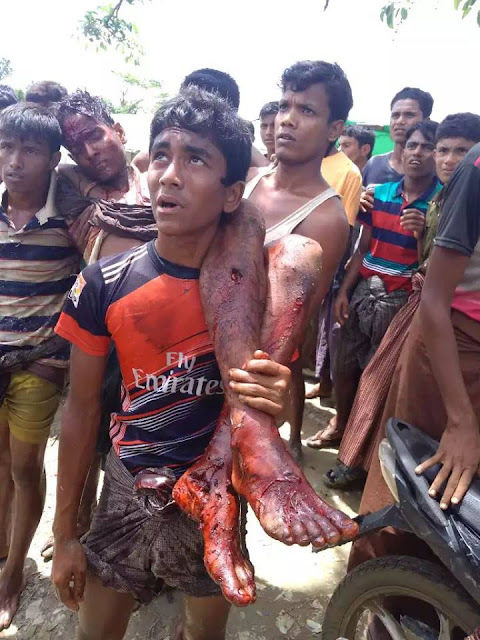 The incident happened nearby the village of Pyaung Paik in Northern Maungdaw Township, Rakhine state, at around 10:00am today (July 15) as one farmer stepped on a landmine when the they were harrowing their farmlands for paddy cultivation. According to the local sources, the landmines were planted by the Myanmar military during the so-called 'Region Clearance Operation' that lasted from October 2016 to February 2017. Under disguise of 'Region Clearance Operation' to crack down on the rebels that launched post midnight attacks on the Border Guard Police (BGP) headquarter in Maungdaw on October 9 last year killing nine policemen, the Myanmar military have committed atrocity crimes against Rohingya population killing hundreds of people, burning down or partially destroying dozens of villages, displacing more than 70,000 villagers and forcing other around 70,000 people to flee to Bangladesh as refugees. Many human rights groups worldwide have condemned the Myanmar government actions as the Collective Punishment on the Rohingya population at large. The person wounded is: Imaan Hussein (s/o) Fedaan, 15. Local sources say that numbers of landmines have been planted by the Myanmar military during October 2016. Please send email to: editor@rohingyablogger.com to send your reports and inquiries.